3. Departments of Pediatrics, Medical College of Wisconsin, Milwaukee, WI 53226, USA. Natural killer (NK) cells are one of the first cells to recover following allogeneic hematopoietic stem cell transplantation (HSCT), and are believed to play an important role in facilitating engraftment or preventing post-transplant infection and tumor recurrence. Recent studies have provided novel insights into the mechanisms by which NK cells mediate these highly clinically relevant immunological functions. In particular, the ability of NK cells to reduce the risk of graft versus host disease (GVHD) and increase the graft versus leukemia effect (GVL) in the setting of human leukocyte antigen (HLA)-haploidentical HSCT highlights their clinical potentials. NK cells also mediate anti-viral protection, in particular against cytomegalovirus (CMV), an infection that causes significant morbidity and mortality following transplant. Another crucial function of NK cells is providing protection against bacterial infections at the mucosal barriers. NK cells achieve this by promoting anti-microbial defenses and regeneration of epithelial cells. These recent exciting findings provide a strong basis for the formulation of novel NK cell-based immunotherapies. 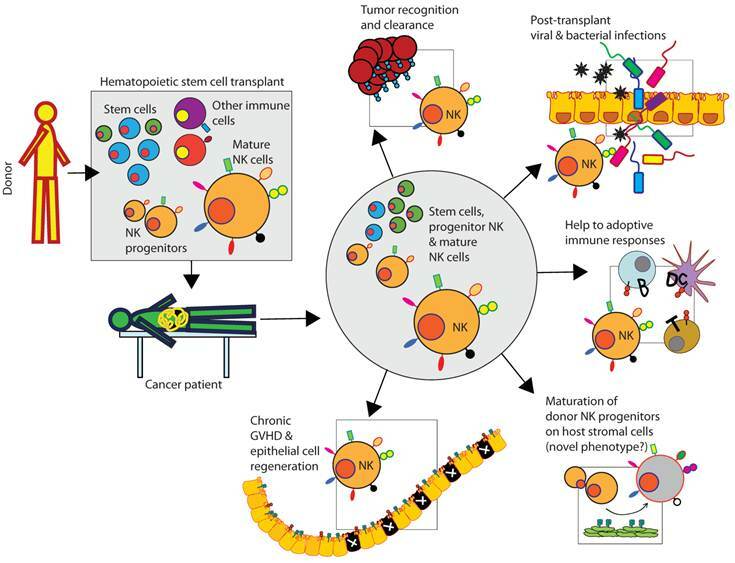 In this review, we summarize the recent advances related to the mechanisms, functions, and future clinical prospects of NK cells that can impact post-transplant outcomes. NK cells protect against a variety of cancers and infections1. NK cells develop in the bone marrow and constitute about 5-10% of total lymphocytes in the peripheral circulation and secondary lymphoidal organs. Effector functions of NK cells include direct natural cytotoxicity, antibody-dependent cellular cytotoxicity (ADCC), as well as secretion of inflammatory cytokines and chemokines that indirectly regulate the functions of other immune cells2, 3. These effector functions are mediated through multiple independent activation receptors expressed on NK cells. Recent studies have revealed that NK cells also provide unique immunological assistance for the regeneration of tissues, such as epithelial cells4. As one of the first lymphocyte populations to recover5, 6, NK cells play an important role in immune reconstitution following HSCT. NK cells both modulate the immune system as well as mediate direct killing of malignant or infected cells. Conventional human NK cells are identified by the expression of CD56, NKp46 and by the absence of CD3. Other cell surface receptors commonly expressed in NK cells fall within three families. They are, 1) killer immunoglobulin like receptors (KIR), 2) NKG2A-C that form a heterodimer with CD94, and NKG2D, which is expressed as a homodimer and relies on DAP10 and DAP12 adaptor proteins, and 3) natural cytotoxicity receptors (NCR) (Table 1). Although other NK-like subsets that share functions with conventional NK cells have been recently described7, 8, for the purpose of this review article, we will focus on conventional NK cells. NK cell development occurs in the bone marrow. The association of distinct effector functions with unique NK cell subsets is thought to be developmentally regulated9, 10, which refers to the 'education' or 'licensing' of NK cells. This early maturation process is shown to be strictly dependent on the expression of inhibitory KIR by the developing NK cells. Many of the KIR molecules recognize HLA class I molecules as their cognate ligands. Thus, the process of education occurs through the ligation of an inhibitory KIR with its respective MHC class I ligand expressed on the bone marrow stromal cells. This interaction with the self MHC sets an activation threshold and 'educates' the NK cell to have a 'fixed' cytotoxic potential11. When tumor transformation or pathogen infection leads to a reduction or absence of MHC class I, the set activation threshold of the NK cells overcomes the inhibition to mediate the killing of the target cells. In the event this education does not occur, the NK cell will not have potent cytotoxic activity, and will become tolerant and inactive. Recent studies have shown that this failure to educate can be overcome by viral infections12 or by cytokine activation with IL-1513. The mechanism by which this occurs has yet to be investigated; however, a role of 'induced-self' ligands is of high probability. Common Cell Surface Markers for Conventional NK Cells. NK cell subsets are classified based on phenotypic or functional differences. Although NK cells can fall into distinct categories based on their KIR (human) or Ly49 (mouse) expression, the functional relevance of these subsets has yet to be determined. KIRs are markers that are imperative in regulating interactions between NK and other cells. All cells in the body express human leukocyte antigen (HLA) class I receptors, including A, B and C. HLA-B and HLA-C function as ligands for specific KIRs (Table 1). The extracellular portions of KIR are homologous, regardless of whether they are activating or inhibiting. However, the intracellular portion of KIR contains either an immunoreceptor tyrosine-based activation motif (ITAM) or immunoreceptor tyrosine-based inhibition motif (ITIM). KIR are able to detect 'missing-self', or 'induced-self', which helps the NK cell mediate an attack against transformed, infected, or foreign (donor) cells. Additionally, KIR expression may help predict anti-viral immunity14 and anti-tumor effects15. Other NK cell receptors that regulate their interactions with target cells include the heterodimer lectin receptors NGD2A-C, which associate with CD94, as well as the homodimeric NKG2D. These can be inhibitory (NKG2A) or activating (NKG2C or NKG2D). NKG2C is important in mediating defense against CMV16, 17, and NKG2D has been shown to mediate anti-tumor effects18. Current studies indicate that based on their functional abilities, human NK cells can be divided into two major subsets, CD56brightCD16dim and CD56dimCD16bright.19 In the mouse, the analogous NK subsets are identified by CD27brightCD11bdim and CD27dimCD11bbright, respectively 19. The CD56dim compromise 90% of peripheral NK cells and are more effective at mediating cytotoxicity using granzyme B, perforin, FasL and TRAIL, or ADCC3. The CD56brightCD16dim constitute only a minority of the total NK cells, and produce immuno-regulatory cytokines3. These CD56brightCD16dim NK cells are thought to be precursors to the CD56dimCD16bright NK subset20. Donor-derived NK cell recovery following HSCT has been extensively studied, and has provided a novel way to study the ontogeny of NK cells, as well as to increase our understanding regarding the influences of KIR expression and maturation on clinical outcomes. Even in the setting of fully matched HLA transplants, there is a high likelihood that KIR genes are mismatched21-23. In unrelated transplants, this likelihood increases, as only 0.24% of unrelated individuals will have matching KIR21, 22. The phenotypic maturation of NK cells following transplant appears to follow a specific pattern. Regulation of maturation can be mediated by the status of KIR ligand matching24, 25, infections16, 26, and cytokines13. Initially, an expansion of CD56bright cells has been described; these cells display an immature phenotype as evidenced by high expression of NKG2A/CD94 heterodimer27-29. Following that, acquisition of KIR, NKG2C, NKG2D and CD57 occur 21, 22, 24, 27, 30-33. KIR expression is modulated by several factors, including KIR haplotype21, surrounding HLA class I molecules 30, 34 and intrinsic genetic factors that regulate KIR expression35 . Within six months to a year, the NK cells will frequently have a more conventional phenotype, and will often revert to that of the donor21, 27, 33 . NK cells following HLA-haploidentical or half-matched HSCT significantly reduces the relapse of acute myeloid leukemia (AML)22, decreased GVHD36-40, improved engraftment and the overall survival as reported by some groups 36, 37, 41. When this principle was applied to other types of transplants (Table 2) the results have varied significantly42-44. In some studies, KIR-ligand mismatches demonstrate an improved overall survival45, 46, however, this wasn't observed in other studies43, 47-49. In the majority of studies, KIR-ligand mismatch was associated with increased acute GVHD47, 50. Several studies demonstrate a reduced risk of relapse with missing KIR-ligand37, 50-52; however, one study demonstrated an increase in relapse53. KIR matching and GVHD outcomes. URD: Unrelated donor, MRD: Matched related donor, MA: Myeloablative, RIC: reduced intensity conditioning, UCB: umbilical cord blood, AML: acute myelogenous leukemia, ALL: acute lymphocytic leukemia, MDS: myelodysplastic syndrome, KIR-L MM: KIR-ligand mismatch, OS: overall survival, DFS: disease free survival, TRM: treatment related mortality, aGVHD: acute graft versus host disease, cGVHD: chronic graft versus host disease. To be able to critically compare the different studies, it is important to understand specific parameters that were used in each one of these studies. For example, earlier studies did not look specifically at the genotype or phenotype of donor KIR, but rather missing KIR ligand54. In this case, the high resolution typing of HLA-C and HLA-B were performed and grouped into one of four categories to determine if there are correlating inhibitory KIR, and if so how many. For example, HLA-C group 1 alleles (Ser77 and Asn80) are recognized by KIR2DL2 and 2DL3; HLA-C group 2 alleles (Asn77 and Lys80) are recognized by KIR2DL1; HLA-Bw4-positive alleles (Arg79, Ile80, Arg83 or Arg79, Thr80, Arg83) are recognized by KIR3DL1; and Bw6-positive alleles (Arg79, Asn80, Gly83), have no known ligands for any inhibitory KIR. In this model, patients are grouped according to homozygosity for HLA-C group 1, HLA-C group 2, or HLA-Bw6. Under the assumption that an individual has a full complement of inhibitory KIRs, patient homozygosity for HLA-C group 2 indicates lack of ligand for donor inhibitory KIR2DL2 or 2DL3; patient homozygosity for HLA-C group 1 implies lack of ligand for donor inhibitory KIR2DL1; and patient homozygosity for HLA-Bw4 implies lack of ligand for donor inhibitory KIR3DL137. As technology improved and additional tools were available, the focus switched more to the presence of activating or inhibitory KIRs. This can be performed in several ways. First is to analyze for absence or presence of KIRs through genotyping, in which case the genomic DNA for KIR is assessed. This can be simplified by considering two major haplotypes of KIR molecules based on gene content: haplotype A and haplotype B55. Haplotype A contains minimal activating KIR molecules, many inhibitory KIR; this haplotype is found in around 60% of the Caucasian population, and the majority of the Japanese population55. Haplotype B contains the inhibitory KIR, as well as multiple activating KIR55,23. Although genotyping is a reliable method of analyzing KIR, it is important to keep in mind that genotype is not always congruent with phenotype21, 33. However, even if the differences of analysis of NK cells with regards to transplant outcome are taken into consideration that still does not completely explain the wide variations in the clinical outcomes. One potential explanation for this differential effect of NK cells on transplant outcome may relate to the clinical conditions of the transplant. There appear to be several transplant related variables that regulate NK cell development, including T-cell depletion (TCD) and recipient HLA-C/KIR ligand. One study comparing TCD and T cell replete transplants, demonstrates that the percentages of NK cells were similar in both conditions; however, the KIR expression was higher in patients who had a TCD transplant56. Similar observations have been made in HLA-haploidentical transplants, where TCD grafts are very frequently used37, 38, 57. This may be explained by the lack of competition for cytokines as a result of T cell depletion58; therefore, allowing for more rapid NK cell maturation. However, other studies suggest that NK cell reconstitution is slower in the setting of TCD13, or not affected24. The presence or absence of matching KIR ligand may also impact NK cell reconstitution. For example, following transplant, increased cytotoxic activities were observed in those patients who have matching KIR ligands9, 24, suggesting NK cells require education in order to attain maximum function. Additionally, matching KIR ligand can also improve IFN-γ secretion following HSCT, a response that is enhanced by increasing numbers of matching KIR-KIR ligand31. Moreover, missing KIR ligand has been shown to be associated with improved clinical outcomes following transplant, which is thought to be mediated by NK cells36, 37, 50,37. Some of these differences may be attributed to the method by which the functionality was assessed13; however, there are likely multiple mechanisms by which these interactions regulate NK cells. NK cell function may also be influenced by medications given in the post HSCT setting including cyclosporine, rapamycin, FK506 and mycophenolate, which are frequently used for GVHD prophylaxis 59-61. In summary, we conclude there are many factors that drive donor-derived NK cell maturation and function in the host. Detailed studies are required to exploit the beneficial effects of NK cells in the clinical setting. The importance of NK cells in anti-viral immunity was first demonstrated by the discovery that patients with a congenital deficiency of NK cells have overwhelming viral infections62. This was supported by previous data where decreased NK cell function was associated with exacerbated viral infections in transplant patients63. Two groups have identified an autosomal recessive trait that involves a mutation of mini-chromosome maintenance-deficient 4 (MCM4) gene, this results in a truncated protein p.Pro24ArgfsX464, 65. Phenotypically, this results in adrenal insufficiency, short stature and NK cell deficiency. These patients were also more susceptible to severe viral infections, further confirming the role of NK cells64, 65. Viral infections, in particular, CMV and respiratory infections, often pose a particular danger for patients following HSCT66-68. Extensive studies have been done in understanding the role of NK cells in clearing CMV and how this virus evades the innate immune responses69, 70. (Table 3). Therefore, in this section we will focus on the role of NK cells during CMV infection. NK cells play a large role in the control of CMV infection. Much of this work has been done in mice, using murine CMV (MCMV) models. When a mouse is infected by MCMV, the infected cells present m157, a protein similar to HLA class I molecules71. This interacts with Ly49H, which is an activation receptor on the surface of murine NK cells analogous to KIR71, 72. Depending on the strain of mice, the function of m157 can be either an activating or inhibitory71. In the B6 mouse, m157 interacts with activating Ly49H, which allows the NK cells to control MCMV73. In other mouse strains, different receptors in the Ly49 family are involved69. This control is mediated through secretion of IFN- γ as well as direct cytotoxicity70. Interestingly, it has been found that MCMV can overcome even a lack of 'education' of the NK cells, so in the event the NK cell has not yet encountered MHC class I antigen, which allows it to be activated, the NK cell can still mediate effector functions against MCMV12. Also, NK cells play a protective role in CMV reactivation and infection following HSCT. There is evidence that NK cells proliferate during CMV viremia in solid organ transplant patients, as evidenced by a higher frequency of NK cells with increased CD57, decreased NGK2A and high Ki-6714. Zaia et al demonstrated that expressing activating KIR2DS2 and KIR2DS4 was protective against CMV reactivation74. This protective role was confirmed by another study from that group that demonstrated that increased expression of KIR2DS2 and KIR2DS4, as determined by analyzing the quantity of respective messenger RNA, was associated with decreased CMV reactivation14. Several studies have demonstrated that the presence of more than one activating KIR was associated with a reduction of CMV reactivation in HLA-matched sibling donors75-77. Whereas, the number of activating KIR expressed appears to impact CMV reactivation74, viral infections were not found to be affected by donor haplotype in unrelated donors78. Interestingly, CMV sero-positivity and reactivation may also help shape the NK cell repertoire. Several groups have demonstrated an increase in IFN-γ-positive NKG2C+ NK cells following CMV reactivation in patients who had undergone umbilical cord blood transplant16, 79 and HLA-matched related and unrelated transplants17 These NK cells also demonstrate high levels of activating KIR, and a more mature phenotype16. Expansion of NKG2C+ NK cells has also been observed in non-transplant patients with exposure to CMV26, 80. In summary, NK cells appear to play a protective role against CMV following HSCT. Number of activating KIR expressed, in particular KIR2DS2 and KIR2DS4, help mediate the protection. There is also evidence that CMV infection may help shape KIR repertoire, evidenced by the presence of NK cells with a more mature phenotype following CMV infection. One of the less explored clinical aspects of NK cell effector functions is their ability to produce cytokines that are directly involved in tissue regeneration. Following HSCT, both GVHD and infections can result in mucosal and epithelial destruction. Of infections, community acquired respiratory infections can result in significant morbidity and mortality. Based on data from our laboratory4, NK cells likely play a role in both mediating anti-microbial effects as well as providing support for tissue regeneration. The role of NK and NK-like cells in mucosal immunity is an area of active investigation. Many studies have demonstrated NK and NK-like cells that produce IL-22 are present in the intestine, tonsils, and other mucosal organs81-88. IL-22 acts primarily on epithelial cells, resulting in increased repair and proliferation, as well as production of anti-microbial proteins89. Allogeneic bone marrow transplantation and NK cell-mediated anti-viral immunity. Both conventional NK cells and NK-like cells contribute to mucosal immunity. In the gut, NK-like cells display an immature conventional NK phenotype and are characterized by several unique features. They are dependent on transcription factor RORγt, and do not require IL-15 for their development. These cells also produce abundant IL-22 but do not secrete high levels of IFN-γ and granzyme90. A similar subset has been described in human tonsils81. However, in our laboratory and others, the NK cells responsible for IL-22 in the lung have a more conventional phenotype, in that they are IL-15 dependent, and display a more mature NK phenotype4, 82. NK cells play a crucial role in the control of influenza infection. This was first described almost 30 years ago, and has been an active area of research91. The hemagglutinin (HA) expressed on the surface of infected cells binds to NKp4692-96. This control is mediated by both release of IFN-γ and modulation of dendritic cells, as well as direct cytotoxicity of infected cells82, 92, 94, 97, 98. Further, in a murine model, depletion of NK cells increases mortality from the influenza virus99. Our recent studies demonstrate that in addition to controlling infection, NK cells play a critical role in epithelial cell regeneration. We have demonstrated the importance of NK cells in epithelial regeneration in a murine influenza model, specifically through production of IL-224. We found that IL-22-/- mice had significantly higher morbidity and mortality during influenza infection when compared to that of wild type mice. This is reversed by adoptively infusing the IL-22-/- mice with IL-22-sufficient NK cells4. This data suggests that conventional NK cells in the lung may play both anti-infective as well as pro-regenerative roles. This finding is supported by previous studies demonstrating protective role of NK cells against Staphylococcus aureus infection following influenza infection, which is postulated to be due to improved epithelial cell regeneration, and production of anti-bacterial peptides100. These peptides, β-defensins 1 and 2, are thought to be secreted by epithelial cells in response to IL-2287. Another group has also demonstrated the protective role of IL-22 in influenza infections, though they report it is secreted by invariant NKT cells, rather than conventional NK cells84. Most of what is known regarding human NK cells during influenza infection has been derived from in vitro studies using peripheral blood 93, 98. Although that data provides meaningful information regarding the interaction of NK cells with dendritic cells (DC), it is unclear whether that provides insight into what is happening in the respiratory mucosa. There is evidence that in particular NK cells play a role in mucosal immunity against influenza. One study evaluated NK cells in nasal lavage of smokers following live attenuated influenza vaccine (LAIV), and found that although the NK cell numbers were not altered, they appeared to have a different phenotype in smokers as compared to non-smokers101. In non-smokers, the CD56dimCD16+ had higher levels of granzyme B, suggesting improved cytotoxic function as compared to non-smokers101. These differences were not appreciated in the peripheral blood analysis101. The cells were not analyzed for their functional capacity, so it is unclear what their abilities are relating to cytotoxicity, cytokine secretion, or mucosal repair4. The NK subset identified in human tonsils preferentially secretes IL-22 and CCL20 but not IFN-γ81. These cells also do not have high amounts of granzyme B, suggesting their cytotoxic effect is limited, and appear to be similar to the NK-like cells described in the intestinal mucosa. Although this data is intriguing, it is limited, and the identification of NK cell subsets that are present in different human tissues warrant further investigations. NK cells may provide a regulatory role following allogeneic stem cell transplant. Several studies have demonstrated reduced GVHD thought to be mediated by NK cells 36-38, 102, 103. Rivas et al have demonstrated the ability of NK cells to lyse chronically active CD4+ T cells in a murine model, thought to represent a potential ability to control chronic GVHD104. Only possible mechanism involves NK cell DNAX accessory molecule-1 (DNAM-1) interactions with T cell markers CD155 and CD161105, this interaction results in lysis of activated T cells. Another possible mechanism involves interaction between NKG2D receptor and T cell marker H60, which also results in destruction of activated T cells 106. Other studies suggest that NK cells may control CD8 proliferation by competing for IL-15107. NK cell may also lyse dendritic cells, which are implicated in GVHD108. NK cell subsets in the intestinal mucosa may play a critical role in development of intestinal GVHD, as well as the regeneration of intestinal mucosa. In the mouse, there have been two subsets of NK cells identified109. One subset shares features with conventional NK cells in that these cells are IL-15 dependent, demonstrate cytotoxic capabilities, secrete high levels of IFN-γ, and have high expression of NKp46, NK1.1, and NKG2D109. The other subset is considered either lymphoid tissue inducer (LTi) cells or NK-LTi. These cells are IL-15 independent, but rely on RORγt for their development, the primary function being the secretion of IL-22109. This subset is protective against infections that can affect the intestines109, 110, including strains of bacteria, such as Citrobacter rodentium in the mouse, which is similar to Escherichia coli in humans111. Although subsets of T cells can produce IL-2289, the significant levels of IL-22 produced during Citrobactor rodentium infection in Rag2-/- mice, suggests that it is less likely to be of T cell origin111. Given that abundant NK cells are present in the intestine, there is interest in the role of IL-22 in intestinal GVHD. NK cells play a critical role in HSCT in both anti-tumor as well as anti-microbial immune responses. There is still much to be learned about novel NK cell functions and developmental regulation of donor progenitor NK cells inside the patient bone marrow. One particularly interesting component of NK cells relates to their dual nature, at times appearing to stimulate the immune system, and other times they regulate immunes response to control the immune system. This difference in function is critical to understand, in particular when considering therapeutic interventions. Their regulatory abilities deserve further evaluation, and could be harnessed to help control GVHD. Another area of interest is the role of NK cells in mucosal immunity. In murine models, a subset of pulmonary NK cells provides both conventional NK cell functions and novel regenerative properties through their ability to secrete IL-22. Given the substantial morbidity and mortality due to respiratory viral infections following HSCT67, 112-116, understanding the role of NK cell subsets in the lung on anti-viral immunity would potentially lead to therapeutic interventions. Clinical relevance of donor-derived NK cells in patients following HSCT. Donor-derived bone marrow contains stems cells, immune cells including immature and mature NK cells. Mature NK cells recognize tumor cells and kill, mediate innate immune responses to prevent viral and bacterial infections, and provide help to T and B cells to coordinate the anti-tumor adoptive immune responses. Additionally, donor-derived stem cells can acquire a distinct NK phenotype by maturing in the host (patient) HLA environment. NK cells can also participate in the regeneration of tissues including the epithelial cell layers. Corresponding author: Jeanne M Palmer, jpalmeredu or Subramaniam Malarkannan, subra.malaredu.